This Series is dicontinued. Please see the LCFL Series or LCFD Series as possible substitutes or contact engineering for assistance. 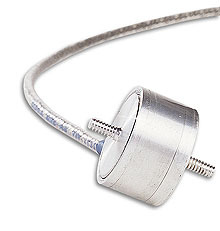 OMEGA’s LCFA Series load cell is a reliable and accurate load sensor. It is constructed of high quality 17-4 ph stainless steel which assures accurate and repeatable measurements (units of 25 lb capacity and under are constructed of aluminum). The internal construction of these load cells consists of a full four-arm Wheatstone bridge, which assures excellent long term accuracy from 10 grams to 10,000 lb. 참고: Ranges 50 pounds and up are made from17-4 ph stainless steel. Ranges 25 lb and below are of Aluminum construction.